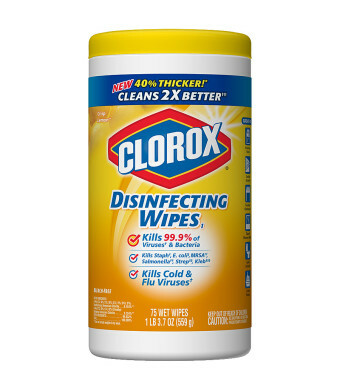 Clorox Disinfecting Wipes can take on bigger and tougher messes with the new and improved thicker wipe with two times the cleaning power compared to a wet paper towel. 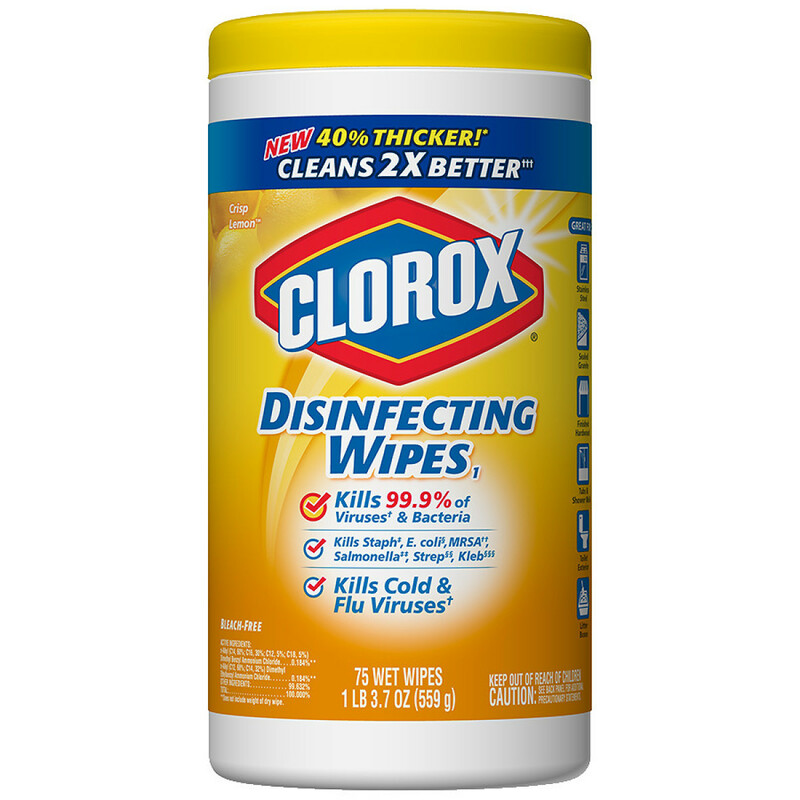 They are 40% thicker than previous wipes for better durability and better particulate pickup with the same Clorox disinfecting power. Clean grease, soap scum and dirt and kill 99.9% of germs that can live on surfaces for up to 48 hours. Each wipe can kill 99.9% of viruses and bacteria including Human Coronavirus, Influenza A2 Virus, Staph, E. coli, MRSA, Salmonella, Strep and Kleb. Remove more than 99% of allergens like dander, dust mite and pollen with the ease of a wipe. These wipes are safe for use on a variety of hard and nonporous surfaces including finished hardwood, sealed granite and stainless steel. Clean, disinfect and deodorize your kitchen, bathroom, car, grocery cart or your workplace with this bleach free formula. 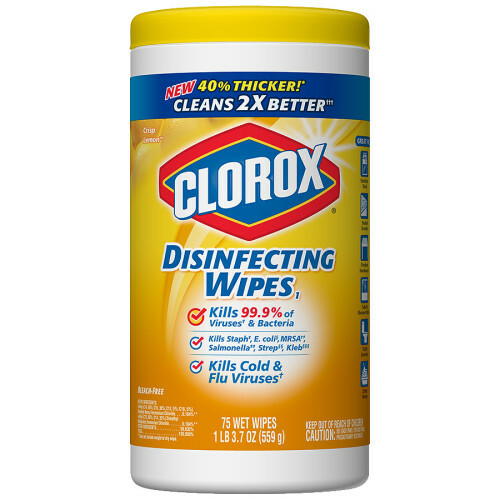 Clorox Disinfecting Wipes has the power to clean and disinfect anywhere dirt and germs may be lurking. To open package: Pull out wipe from center of roll. Next sheet pops up automatically. Close lid to retain moisture. It is a violation of Federal law to use this product in a manner inconsistent with its labeling. Not for cleaning or sanitizing skin. Do not use as a diaper wipe or for personal cleansing. To disinfect: Use to disinfect hard, nonporous surfaces. Wipe surface to be disinfected. Use enough wipes for treated surface to remain visibly wet for 4 minutes. Let surface dry. For highly soiled surfaces, clean excess dirt first. To clean and remove allergens: Wipe surface clean with Disinfecting Wipes. Let air dry. To sanitize: Use to sanitize/deodorize hard, nonporous non-food contact surfaces. Wipe surface. Use enough wipes for treated surfaces to remain visibly wet for 10 seconds. Let surface dry. For highly soiled surfaces, clean excess dirt first. For surfaces that may come in contact with food, a potable water rinse is required. This product is not for use on dishes, glassware or eating utensils. Disinfecting Wipes will not harm most surfaces, including acrylic, sealed fiberglass, sealed granite, finished hardwood and vinyl. Not recommended for use on unpainted wood, unfinished, unsealed, unpainted, waxed, oiled or worn surfaces. Test a small area first. Storage and disposal: Dispose of wipe in trash after use. Do not flush. Tightly close lid between uses to retain moisture. Nonrefillable container. Do not reuse or refill this empty container. Offer empty container for recycling. If recycling is not available, discard container in trash.